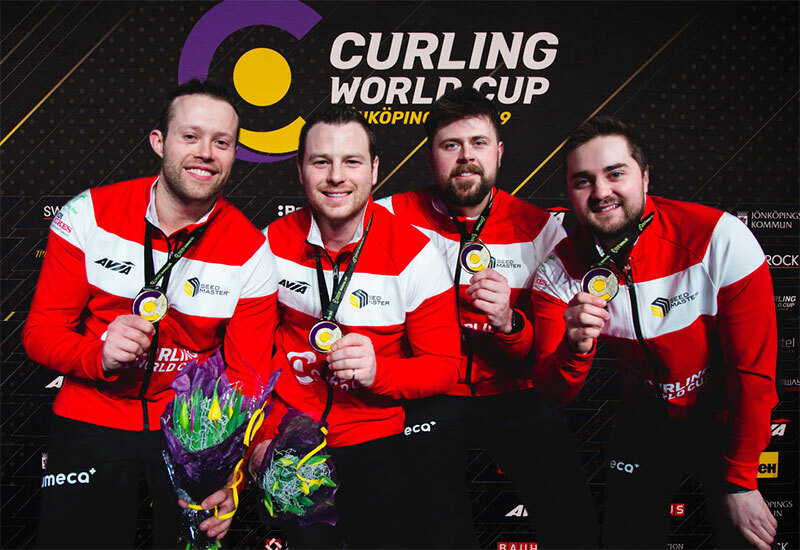 Jonkoping, Sweden - Canada's Matt Dunstone (Photo: Celine Stucki / WCF) captured the Curling World Cup leg three title over home favourites, Sweden's Niklas Edin 5-4 at the Jonkoping Curling Club in Sweden. In front of a partisan crowd, the Saskatchewan-based rink kept their composure as skip Dunstone made his last-stone hit for the victory. Dunstone and teammates - third Braeden Moskowy, second Catlin Schneider and lead Dustin Kidby - came into Jonkoping as late replacements but made an outstanding impact throughout the week. The foursome pick up a cheque for $USD 20,000 (plus $USD 8,000 in round-robin earnings) and seal a spot in Beijing's inaugural Grand Final this May, with a prize pot of $USD 112,000 up for grabs. "I think we made a statement this week for sure," said skip Dunstone, 23. "We didn't event expect to be in this event at the beginning of the year so to come here and take advantage of it beating a world-class team like Niklas Edin, we're going to be celebrating this one. "The deuce in the fifth to go up two after giving up the steal in the first end was key. Niklas missing that split in seven was the game changer to give us hammer coming home. "[On Grand Final] It will be a heck of a field. I never thought in a million years I would be in China twice in sixth months. It will be a lot of fun, another world-class event I'm sure and hopefully win another chunk of change there." The two teams were at a dead lock 2-2 after four ends, when Canada took back control in the fifth end with a routine hit for two points. However, after a bad start to the sixth end, a triple take-out by Edin was compounded by a Dunstone miss to give Sweden a draw for two. But a massive error in the seventh end, with Edin's attempt at a biter falling short, costing the Swedes a chance of victory in front of a home crowd as Dunstone blanked the end to take the hammer into the last. The skip delivered a takeout to pick up one and win leg three to join fellow Canadians, Team Kevin Koe, in Beijing's Grand Final. Edin said: "It was a close game and it was pretty well played as well. We made a few too many positional errors we didn't get rocks in the right placements early on. "We kept it close, tied after six ends it's pretty close to 50/50, but then I missed my draw in seven - that changed a lot. But it always felt like we were one step behind the whole game." The world champions earned $USD 10,000 (plus $7,500 in round-robin earnings) for their week's work in Jonkoping.